Revealed a couple days ago at GDC by Crytek, here are the details about the CryEngine 5 along with a showcase video. The next stage of the engine introduces among other things DirectX 12 support, new overhead rendering and new particle system. Update: VRScore's Sky Harbor teaser added. FRANKFURT, Germany / SAN FRANCISCO – March 15, 2016 – As the 2016 Game Developers Conference gets underway, Crytek has announced the arrival of CRYENGINE V – the most accessible, powerful, and feature-filled version of their all-in-one development solution to date. CRYENGINE V launches today with a “Pay What You Want” business model, offering developers everywhere total access to the engine’s feature-set and full engine source code for a fee of their choosing, and with no obligation to pay royalties or additional service charges. 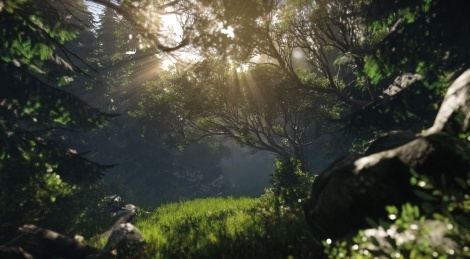 Users who decide to make a contribution for utilizing CRYENGINE V can allocate up to 70% of the sum to Crytek’s new Indie Development Fund – a grant program that will see Crytek directly supporting promising indie projects around the world. • C# Enabled: A new API that allows developers who know C# to start scripting in CRYENGINE V right away. • Reworked Low Overhead Renderer: Significantly increases the performance of today’s hardware in graphically intensive applications. • DirectX 12 support: Utilize the latest branch of DirectX to take greater control of hardware resources. • Advanced Volumetric Cloud System: Optimized for VR to give clouds full 3D spatial rendering for higher quality with minimal performance hit. • New particle system: Create stunning real-time fluid effects, handled almost entirely on the GPU. • A new launcher and UI: Navigate CRYENGINE more intuitively thanks to a streamlined UI which includes realigned features and new icon groupings. • FMOD Studio support: Allowing greater flexibility in audio middleware selection. • CRYENGINE Answers: A dedicated channel where the CRYENGINE community can share questions and answers. Quite awful images IMHO...weird coming from Crytek...WTH??? Yeah, ugliest graphics I have ever seen. Even Downgradevision looks better, not to mention Hitman, the best looking and best optimized game in a long time. You know...it´s getting a little bit boring about that Division. So far one of the most impresive games graphics and performance wise. A) these are older titles being shown off as a "look what (mostly small) studios have done" showcase. This update is primarily a tools update. The engine itself doesn't seem that different, just more efficient and with more modern particle systems. Everything else is behind the scenes tools and features that are mostly for developers and perhaps modders, not the end user. Some people really need to have their irony detectors checked out. It looks alright i can agree though will little reason to upgrade when Cryengine 3 was pretty detailed as it was. "DirectX 12 support, new overhead rendering and new particle system." hard to imagine the need of a whole number revision just for this. UE4 is doing it through updates. It looks great but the gfx jump is not having wow factor anymore. PS3 era was a big jump from PS2. These days everything looks more polished and next gen I think it will be more or less same. Just more stuff on screen and 60fps will become the new 30fps especially with VR as it will become mainstream next gen ? There's a hell of a lot more purpose to an engine than just looking pretty. Go for it... but there are few games that look better.